Take our poll: name the sheepdog keeping the solar “lambscapers” safe! 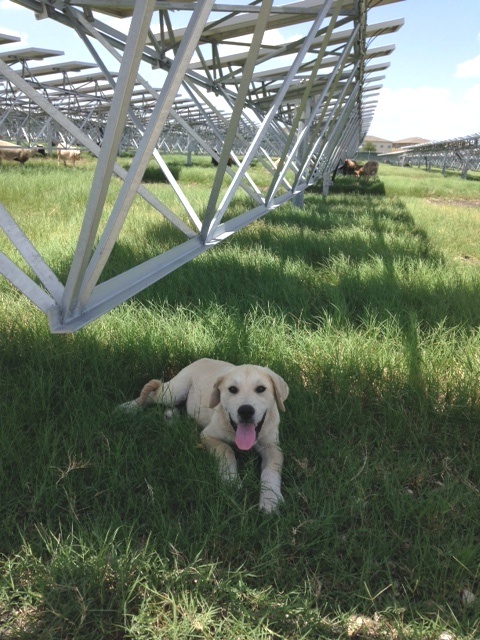 As detailed in a post by Scott Wudel, our New Energy Economy partner OCI Solar Power employs some innovative “lambscapers” to help maintain the grounds at Alamo 2, a 4.4 acre solar farm on San Antonio’s Binz-Engelman Road. What should we call the pooch that keeps the solar lambscapers safe? In addition to about 90 head of lambs, ewes and sheep, the company uses four-legged sheepherders who romp the grounds and makes sure wiley coyotes keep their distance. A local sheep farmer supplies the pooches and runs different dogs through a “job rotation” program that keeps the herd safe. The most recent candidate, a friendly Great Pyrenees mix, needs a name. We’ll announce the winner next week. Sparky is a better name than any posted so far. Flare is thd perfect name! Just left a message re naming dog protecting sheep from coyotes. Great idea,by the way. Think I goofed on sending. I suggest Apollo, sun god and god of light in Greek mythology. One of his daily duties was to drive his chariot across the sky so all could enjoy the benefits of the sun. Could even name the whole pack of guardians “The Apollo Team.” That way the individual dogs could use some of those great names suggested.